Championsgate boasts a magnificent golf complex, where great champion Greg Norman was commissioned to create two fabulous championship courses. Combined with its position close to Disney World and Orlando's attractions, it is clear why Championsgate is a golf holiday favourite. The International Course may be located in Florida, but its designer was once a renowned links golf player, and Norman has clearly drawn considerable influence from his favourite seaside courses in the UK and Ireland. The layout can be stretched to a mighty 7,363 yards from the tips, and during construction it was seeded and planted to play hard and fast, just as a links course should. Fast emerging as a Florida classic, the Norman International Course is a must on your next visit to Orlando. The National Course is more typical of the American resort style golf, carved through 300 acres of woodland and parkland. From the championship markers, the National reaches 7,128 yards, and it is best known for the tree-lined fairways and imaginative bunkering, demanding both accuracy and creativity. Thanks to the outstanding Floridian climate, the courses are maintained in impeccable condition, ensuring an enjoyable golfing element to your next escape to the Orlando area. As if the two golf courses weren't enough, the Omni Orlando Resort is also home to an academy directed by the world famous teacher, David Leadbetter, so fear not if your game is rusty when you head to Florida. The brand new golf development at Championsgate is now complemented by the Omni Orlando Resort, which not only provides easy access to Orlando's theme parks and attractions, but also has a fantastic 5* hotel. The accommodation is courtesy of 730 spacious and well appointed bedrooms, spread across 16 floors. Every guest room is complete with air-conditioning, satellite television, safe deposit box, mini-bar, and luxury bathrobes. Comfort and convenience are the buzz words at the Omni resort, which aims to meet every demand with incomparable service and impeccable attention to detail. 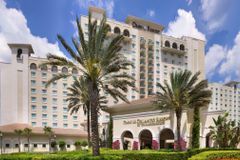 The Spa at the Omni Orlando Resort is constructed and operated in a modern European style, and offers a fantastic range of health and beauty treatments, specifically targeted to maximize both relaxation and indulgence. The Camp Omni is a club dedicated to the younger visitors, offering an endless list of fantastic activities and sports for the children. In addition, there are two outdoor swimming pools, with water slides and a lazy pool, as well as a 2 tennis courts, volleyball and basketball courts, hiking and running trails, and a 9-hole par 3 course. The resort boasts no less than 5 separate restaurants, with something for every occasion. The Championsgate Clubhouse Grille serves hearty meals and drinks, and is where the sunset is accompanied by bagpipes. The resort's working herb garden is the source of many of the vibrant flavours underpinning the menu in the Mediterranean Trevi restaurant.